The 32 metre motor yacht Cloud 9 has been sold with Whit Kirtland at Bradford Marine Yacht Sales acting for the seller and buyer. Built in GRP by Canadian yard Crescent Custom to a design by Jack Sarin, she was delivered in 1994 and has since been refurbished and updated several times. Well appointed accommodation is for six guests in three cabins consisting of a master suite, double and twin cabin, all with entertainment centres, LCD television screens and full en suite shower facilities. Her good sized saloon has a comfortable grouping of a couch and chairs in the centre while to port is a bar, sink, fridge, ice maker and three bar stools. To starboard is a games table with four chairs and an entertainment centre including a 54 inch Samsung LCD television. Further forward is a formal dining area for six guests and the galley. Outside deck areas are extensive and include a sheltered aft deck with a teak table and six matching teak chairs for al fresco entertaining and dining. The flybridge offers two helm seats facing full electronics and controls, a port wet bar, fridge, ice maker and storage while to starboard is built in seating, a table and a large gas barbecue. The entire flybridge area is protected from the sun by a Bimini top. 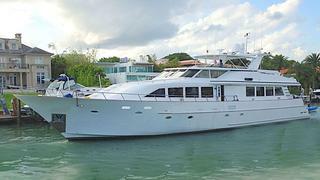 Twin 1,480hp Detroit Diesel engines give her a cruising speed of 12 knots and a top speed of 24 knots. Lying in Fort Lauderdale, Cloud 9 was asking $990,000 and will now relocate to California.